Today, a large number of blind workers collected outside the residence of the Minister of Social Justice and Empowerment, Shri Mukul Wasnik. These workers have been meeting the concerned Minister, as well as officials in the Ministry of Social Justice and Empowerment on several occasions since November 2011. On April 24, 2012, the troubled workers were given an assurance by the Minister that all the blind workers retrenched by the National Federation of the Blind (NFB) in 2011 will be provided alternative employment at the government sponsored NGO, Arunim. However, more than four months down the line, the Minister and Social Justice Ministry are still to honour their assurances. Due to the absence of the minister the blind workers were unable to meet the Minister and took out a march to the Ministry of Social Justice and Empowerment here at Shastri Bhawan. 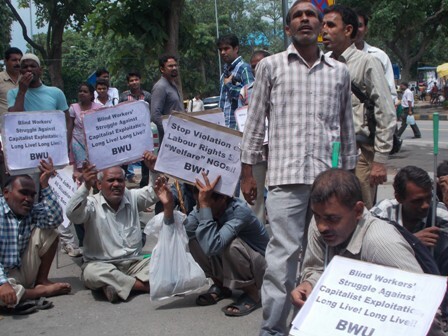 It is to be noted that since November of 2011, the blind workers have been protesting the retrenchment of several blind workers by the NFB. This NGO retrenched the workers because they were speaking out against denial of minimum wages and other basic labour rights in the Training and Rehabilitation Centres (TRCs) run by the NGO. However, the struggle of the workers is not just against the NFB, but also against the overall exploitation of blind workers across the country by private companies and NGOs. Blind workers have been arguing that in the interest of availing of certain benefits like tax exemption the private sector employs persons with disability, but goes on to exploit them brutally. Arbitrary hiring and firing practices, unregulated working hours, payment of wages which are often below the minimum wage rate, etc. are some of the exploitative practices which prevail in the private sector. All these amount to a serious breach of social justice, which is why the bind workers have been continuously approaching the Ministry of Social Justice and Empowerment. More importantly, the workers realize that the failure of successive governments to provide adequate employment to the blind community is the main reason why blind workers are dependent on the highly exploitative private sector. For disabled working class persons who are either unemployed or stuck in highly exploitative private sector jobs, the Government’s decision to sub-let its responsibilities of providing tangible livelihood to NGOs, private companies, etc. is an extremely skewed policy approach. Thus, the blind workers’ struggle is based on the fundamental right to a livelihood—a right the Government is to protect and uphold. (i)	That since the Ministry has failed to curb the blatant violation of labour rights by the National Federation of the Blind (NFB), it should ensure that all the disabled workers employed by NFB be provided alternative employment by the Government with immediate effect. (ii)	Inclusion of a special section in the long pending Bill on the Rights of Persons With Disability (2011), which would safeguard the economic rights of blind workers employed in the private sector. For example, the Bill should include provisions to the effect that bodies violating basic labour rights will be penalized to the effect that NGOs indulging in such violation will face the cancellation of their registration. (iii)	That the Ministry of Social Justice and Empowerment tables a concrete plan of greater job creation for blind persons in the public sector. It is only with the provision of more government jobs that the dependence of blind workers on exploitative private companies and corrupt NGOs can be overcome. After listening to their demands Mr. Pankaj Joshi assured that they will be given employment through some government agency or the Ministry will help in establishment of a cooperative society. Another major victory for the movement is that the Ministry has also conceded inclusion of a provision in the Bill on the Rights of Persons With Disability (2011) where NGOs employing disabled persons will be penalized if they violate the labour laws and the grants to such NGOs from Ministry will also be stopped. Not taking it as their final victory the blind workers resolved to fight till the government does not take its responsibility of providing employment to all disabled persons so that they do not remain exploited and harassed by “welfare” NGOs and private sector.